If you stopped by the UA Poetry Center this past summer, you might have noticed that our children's area was under construction. We were busy installing our Brave Books theme for the 2018-2019 year: Bold Librarians, Readers, and Booksellers of the Arab World. We'll celebrate the grand opening of our new children's area on September 22nd, during the first Kids Create of the school year! In addition to the usual creative writing workshops, the day will include a breakfast concert by master violinist Fadi Iskandar, a selection of snacks from Babylon Market, and a table where Cholla High School students will show participants how to write their names in Arabic. Bold Librarians, Readers, and Booksellers of the Arab World is inspired by three particularly powerful children's books. 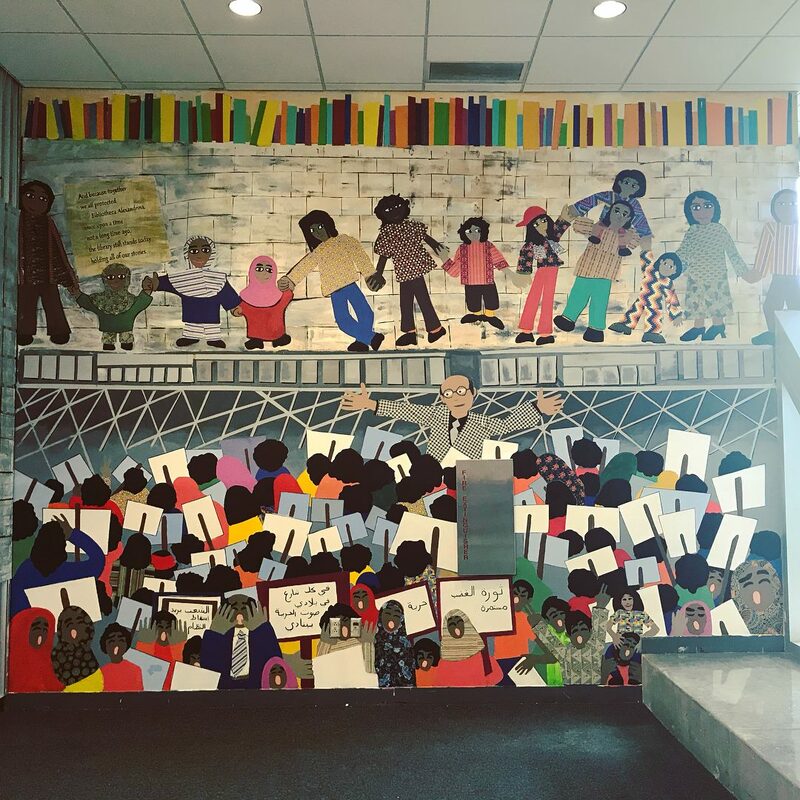 Hands Around the Library--celebrated in a multi-media mural on the wall in the children's area--tells the story of demonstrators who defended the Library of Alexandria as a place of free thought and assembly during the Egyptian protests of January 2011. 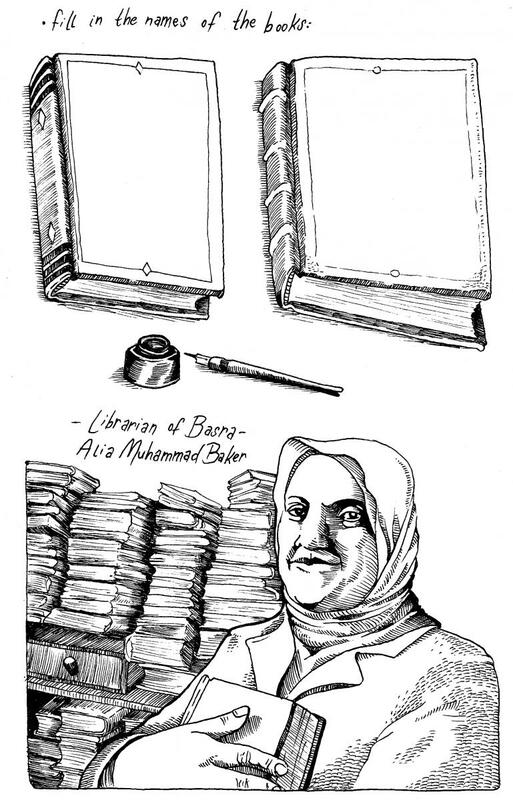 The Librarian of Basra: A True Story from Iraq and Alia's Mission: Saving the Books of Iraq tell the story of Alia Baker, chief librarian of the Basra Central Library, who saved 30,000 books from the building before it was bombed during Iraq's war with Britain and the United States. Baker's story is depicted through interactive playhouses representing the library and the nearby Hamdan Restaurant, where many of the books were hidden. The children's area also includes a book display created in partnership with the Center for Middle Eastern Studies and inspired by Pages, an Arabic-language bookstore in Istanbul that primarily serves Syrian refugees. Bookmarks, a reading list, and an activity booklet in both English and Arabic will be available to take home. We kicked off Brave Books in early September with two K-12 professional development sessions led by Dr. Lisa Adeli of the Center for Middle Eastern Studies. At each of these sessions, classroom teachers developed lesson plans incorporating children's and young adult literature from the Middle East and received books for their classrooms. Later in the school year, Julie Swarstad Johnson will curate a pop-up exhibit of poetry in translation from the Arabic-speaking world and, in April 2019, children's writer and poet Naomi Shihab Nye will give a matinee reading to Tucson-area students. Visit Brave Books any time the Poetry Center is open to read, play, and learn! Brave Books 2018-2019: Bold Librarians, Readers, and Booksellers of the Arab World was created in collaboration with many individuals and organizations including: AZ Humanities, Qatar Foundation International, Lisa Adeli of the UA Center for Middle Eastern Studies, Audra Bauchera and Allison Miller of Alleycat Murals, Nour Jandali and Rose Hattab of Cholla High School, Julie Swarstad Johnson of the UA Poetry Center, Amanda Hunt of the College of Humanities and independent artist Joe Quarnberg. We are grateful for them and for the additional partners we will undoubtedly accumulate over the coming year. We would also like to thank Renee Angle and Aisha Sabatini Sloan for their path-making work on previous Brave Books themes, including Shakespeare & Company and the African National Memorial Bookstore.